This month's edition of Boozehound Unfiltered comes courtesy of The Quiet Man, who's had a bottle of this stuff kicking around his basement for awhile now, courtesy of his neighbors, who brought it back from a trip to Ireland. He's not a whiskey drinker and neither are The Quiet Parents, so guess who got a bottle of whiskey? That's right... this guy! 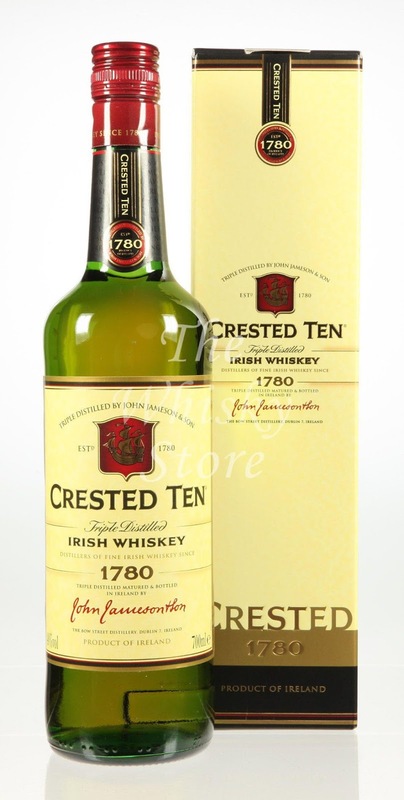 Crested Ten is my first foray into Irish Whiskey in awhile- and at first, I thought I was holding an Irish Single Malt, which would be rare enough to qualify as an amazing score of free whiskey, but further examination of the bottle revealed it to be a blend that's a part of the Jameson range. I took to the interwebs and educated myself a little more: it's not widely available outside of Ireland and enjoys and seems to be something of a highly regarded whiskey. "Like all great Irish whiskeys, for the most satisfying results, this should not be sipped but taken by the mouthful and swallowed slowly." First Impressions: The body hit me almost immediately- this stuff smelled good and you could tell that it had been aged in sherry barrels, but it wore out it's welcome pretty quickly to be honest. It felt weak and watery instead of light and delicate and I was honestly a little disappointed by the end of it- but that was also before I found out you were supposed to drink the stuff by the mouthful instead of sip on it. That said, I went into round two feeling disappointed and wondering if this was going to be the first whiskey that would get a bad review from me. Color: I get real tired of coming up with other words for 'golden' or 'honey' or 'amber' so I asked the Missus what she thought Crested Ten resembled when I held it up to the light. "Piss," she replied. "Or apple juice." I tended to lean toward a solid shade of goldenrod, myself- as it's not dark enough for either honey or amber, at least to me- but if you want a more blunt (and probably more accurate) definition of the color- 'piss' or 'apple juice' works. Body: It's light and delicate- there are lots of floral notes and you can certainly tell that this was aged in sherry barrels. There's an undertone of spice there as well- I wanted to say cinnamon, but wasn't sure enough about that to commit to it. Palate: That mouthful tip really helped- because if you do take it by the mouthful and swirl it around and chew on it a little bit, you get a much better impression of things. That less than impressive first sip? Redeemed! It does sit lightly on the tongue, but as you swirl it around, you can taste how smooth the texture is- it's almost buttery. Finish: Probably my favorite part of the whole experience- there's a nice kick of spice and then very slow, gradual warming that's very pleasant indeed.